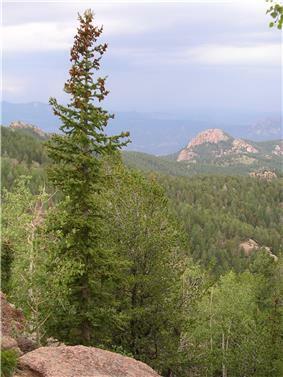 The Pike National Forest is located in the Front Range of Colorado, USA, west of Colorado Springs and including Pikes Peak. The forest encompasses 1,106,604 acres (4,478 km²) within Clear Creek, Teller, Park, Jefferson, Douglas and El Paso counties. The major rivers draining the forest are the South Platte and Fountain Creek. Rampart Reservoir, a large artificial body of water, is located within the forest. The forest is named after American explorer Zebulon Pike. Much of the bedrock within Pike National Forest is made up of the coarse, pink to orange Pikes Peak granite. 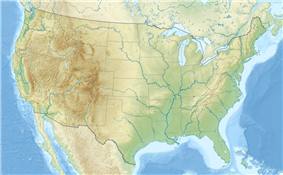 Pike National Forest is managed in association with San Isabel National Forest and Comanche National Grassland in Colorado, as well as Cimarron National Grassland in Kansas and is headquartered in Pueblo, Colorado. 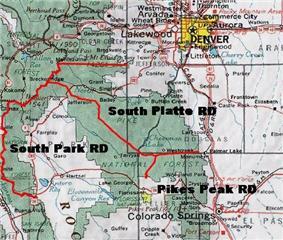 There are local ranger district offices located in Colorado Springs, Fairplay and Morrison. Pike National Forest in the fall. The dry climate of Pike National Forest makes it prime wildfire territory. The first recorded fires occurred in the 19th century, and the forest was recently the location of the Hayman Fire of 2002 and the Waldo Canyon Fire of 2012. The former burned 138,114-acre (558.93 km2) and 133 homes  while the latter burned 18,247-acre (73.84 km2) and 346 homes. The Pike and San Isabel National Forest was recently awarded a major reclamation project to fix the damage from the Hayman wildfire. The project was sponsored by The National Arbor Day Foundation, in conjunction with several university bookstores. Pike and San Isabel was voted the winner from a group of three separate forests. The vote took place at www.buildaforest.com. The school who placed the most votes for Pike and San Isabel National Forest was the University of Central Florida; the Pike and San Isabel National Forest will be a given a name honoring the effort by UCF students, alumni, and supporters. There are three officially designated wilderness areas lying within Pike National Forest that are part of the National Wilderness Preservation System. Two of them extend into neighboring National Forests (as indicated). Most of the forest experiences a Highland climate with warm summers and cold winters. Even in the summer, nights are cool due to the forest's high elevation. Temperatures and precipitation vary widely throughout the forest, depending on elevation. Most of the forest receives more than 100 inches of snow a year.